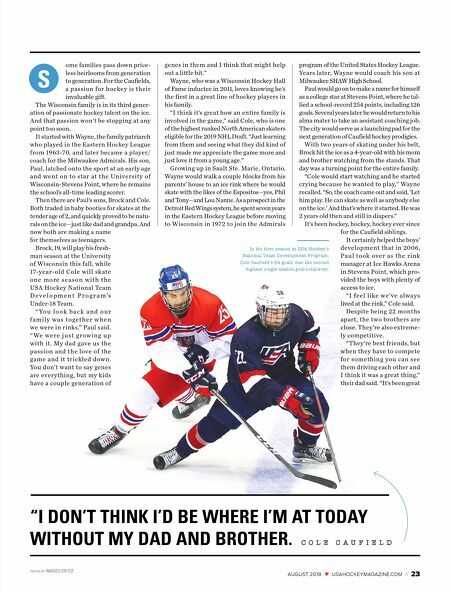 AUGUST 2018 USAHOCKEYMAGAZINE.COM // 23 ome families pass down price- less heirlooms from generation to generation. 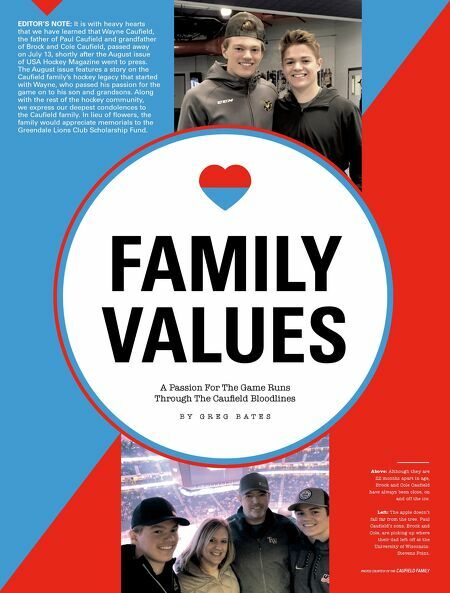 For the Caufields, a passion for hockey is their invaluable gift. The Wisconsin family is in its third gener- ation of passionate hockey talent on the ice. And that passion won't be stopping at any point too soon. It started with Wayne, the family patriarch who played in the Eastern Hockey League from 1963-70, and later became a player/ coach for the Milwaukee Admirals. His son, Paul, latched onto the sport at an early age and went on to star at the University of Wisconsin-Stevens Point, where he remains the school's all-time leading scorer. Then there are Paul's sons, Brock and Cole. Both traded in baby booties for skates at the tender age of 2, and quickly proved to be natu- rals on the ice—just like dad and grandpa. And now both are making a name for themselves as teenagers. Brock, 19, will play his fresh- man season at the University of Wisconsin this fall, while 17-year-old Cole will skate o n e m o r e s e a s o n w i t h t h e USA Hockey National Team D e v e l o p m e n t P r o g r a m 's Under-18 Team. " Yo u l o o k b a c k a n d o u r f a m i l y w a s t o g e t h e r w h e n we were in rinks," Paul said. " We w e r e j u s t g r o w i n g u p with it. My dad gave us the passion and the love of the game and it trickled down. You don't want to say genes are everything, but my kids have a couple generation of genes in them and I think that might help out a little bit." Wayne, who was a Wisconsin Hockey Hall of Fame inductee in 2011, loves knowing he's the first in a great line of hockey players in his family. "I think it's great how an entire family is involved in the game," said Cole, who is one of the highest ranked North American skaters eligible for the 2019 NHL Draft. "Just learning from them and seeing what they did kind of just made me appreciate the game more and just love it from a young age." Growing up in Sault Ste. Marie, Ontario, Wayne would walk a couple blocks from his parents' house to an ice rink where he would skate with the likes of the Espositos—yes, Phil and Tony—and Lou Nanne. As a prospect in the Detroit Red Wings system, he spent seven years in the Eastern Hockey League before moving to Wisconsin in 1972 to join the Admirals program of the United States Hockey League. Years later, Wayne would coach his son at Milwaukee SHAW High School. Paul would go on to make a name for himself as a college star at Stevens Point, where he tal- lied a school-record 254 points, including 126 goals. Several years later he would return to his alma mater to take an assistant coaching job. The city would serve as a launching pad for the next generation of Caufield hockey prodigies. With two years of skating under his belt, Brock hit the ice as a 4-year-old with his mom and brother watching from the stands. That day was a turning point for the entire family. "Cole would start watching and he started crying because he wanted to play," Wayne recalled. "So, the coach came out and said, 'Let him play. He can skate as well as anybody else on the ice.' And that's where it started. He was 2 years old then and still in diapers." It's been hockey, hockey, hockey ever since for the Caufield siblings. It certainly helped the boys' development that in 2006, Paul took over as the rink manager at Ice Hawks Arena in Stevens Point, which pro- vided the boys with plenty of access to ice. " I f e e l l i ke w e 've a l way s lived at the rink," Cole said. Despite being 22 months apart, the two brothers are close. They 're also extreme- ly competitive. "They 're best friends, but when they have to compete for something you can see them driving each other and I think it was a great thing," their dad said. "It's been great PHOTOS BY IMAGES ON ICE "I DON'T THINK I'D BE WHERE I'M AT TODAY WITHOUT MY DAD AND BROTHER. S C O L E C A U F I E L D In his first season at USA Hockey's National Team Development Program, Cole Caufield's 54 goals was the second highest single-season goal total ever.